Well again, after the phenomenal demand and amazing success of our 2017, 2018 and 2019 Nordic walking tour across the Somme and Ypres Salient, we have once again teamed up with Mercian Nordic Walking (www.merciannordicwalking.co.uk) and the fantastic Socks & Chocs charity (www.socksandchocs.co.uk) to bring to you a battlefield tour that is completely different, but this time we have added a day and will be Nordic walking both the Ypres Salient and the Somme battlefields! 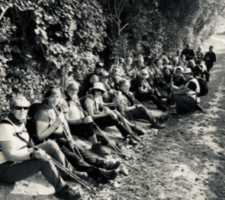 It brings fun, fitness and history together for an amazing five days walking across the battlefields of Flanders and the Somme, and you will be taking in some of the must see sites that you will never forget. For those who have been on any of our Nordic walking tours the walks and some of the stops have been changed so even for you this tour is different! Also as part of our partnership a large percentage of the money made, as we have every year from the tour sales are being directly donated to Socks & Chocs charity so you will also be helping an amazing charity with its valuable work! There are also options for non walkers so if your partners, friends or family prefer to leave the walking to you, you will also be able to visit the same sites, and a few more via our motorised transport! Collection points will start in the Bromsgrove area at 05:00am (you will be notified of the collection point in Bromsgrove nearer to the time of departure) We will then have various pick ups along the M40, M25 and M20 motorway service stations according to the areas bookings are taken. Arrival in Dover will be around 09:00am followed by our ferry crossing around 10:00am. Day One – So after a relaxed trip across the channel we will be heading straight to our hotel which will be in the centre of Ypres and within 3 minutes of all its amenities. Check in will be around 14:00. But don’t get comfortable as the first walk of the trip will begin around an hour later. Walkers will head off towards the history filled Essex Farm area to hear the many stories based around this famous cemetery and those that rest here. Non walkers will also take in the same visit but via coach. There will also be an added stop for the non walkers after Essex Farm. So now you have had a taste to get you in the mood for the rest of the week, walkers will then head back to Ypres as will the non walkers where we will meet up to hear the history of the Menin Gate and then witness the haunting and unforgettable Last Post ceremony. After this Ian has organised for us to taste some real Flemish stew at a local restaurant, but dont worry if thats not your cup of tea then there is an array of other foods on the menu! (Not included in the price) After a very long but rewarding day it will then be up to you if you wish to carry on into the night in the many bars and venues in Ypres or head off to the comfort of the hotel! Day Two – Up and refreshed after a good nights sleep and breakfast, walkers will set off from the hotel in the direction of Voormezele. En route you will stop at the many must see sites, talking history, tactics and much more. Meanwhile non walkers will be taken to visit the vast cemetery at Lijsenthoek where you will hear the personal stories of a few that now rest here. This will be followed by a stop at Poperinghe New Military cemetery for stories of a more controversial nature, but stories that always stir interest and opinion non the less! Around mid day both walkers and non walkers will all meet up again for some lunch (not included in the price) together in Palingbeek where stories and visits of the morning can be swapped before a busy afternoon starts! Once nicely refuelled walkers will set off towards Hooge, again while on route stops will be had taking in the topography of the land at Hill 60 and several other must see sites whilst hearing the many stories of the brave men and women on both sides along the way. Non walkers will also have a packed afternoon with stops at Hill 60, R.E. Cemetery and Sanctuary Wood, again hearing the stories of the area and the actions that took place there. Late afternoon we all meet together again as the walkers reach Hooge. Here we will take in the cemetery, crater and the brilliant museum (not included in the price) where some well deserved down time for the walkers and non walkers can be had. Once everyone has regrouped we head off all together to the jaw dropping Tyne Cot cemetery. This place never fails to hit and stun you and going as a complete group is in our opinion the only option for this very special stop.Once we finish here we will then head back to the hotel where the evening is yours. You can take in the very special last post again, visit one of the many restaurants or bars or just watch the world go by in Ypres stunning market square. Day Three – Today is battlefield swap over day! So the morning will be spent as a group taking in some of the more personal stops to those with us and visits to the smaller sites not always visited as much as they should be.This will then be followed by us all boarding the coach and travelling down to the Somme as we head straight to the mighty Thiepval memorial. From hear walkers will set off taking in the Leipzig redoubt, Connaught and Mill road cemeteries before finishing at the beautiful Ulster tower and its surrounding fields. Non walkers will also visit these sites plus Ancre cemetery but in a little more comfort! Once everyone has reconvened we will head off to our hotel in Peronne for the night and some well earned rest. 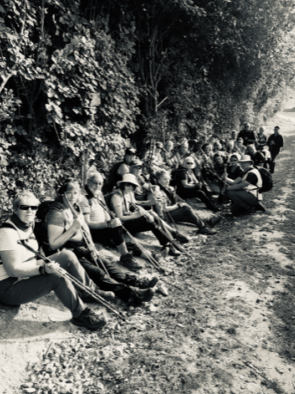 Day four – The heart of the Somme beckons today with a whole day of walking, which is actually three walks into one very long walk, or for those who want to break it up, one or two walks with a gap! Walkers will be dropped at the citadel in the heart of the Somme and will take in stops at Point 110, stand where a very famous MC was earned and then head down to the famous Devonshire cemetery, before heading back up to Mametz to hear stories of the Welsh and the haunting actions in wood. A picnic lunch will be had overlooking the wood (supplied) and then you will head onto Contalmaison where again you will hear stories of gallant actions and famous regiments that were in the area. This will be followed by one final push onto the awe inspiring Lochnagar. This walk is a walk you will never forget, with sites and stories that will stay with you forever. For the non walkers they will not miss out though with stops at all of the same places as the walkers but just in a different order. Day four really is one that will stay in the mind of everyone for a very long time. After a very long day and after we have all met up at Lochnagar we will then head back to Peronne and our hotel for a well earned rest! Day Five – With so much ground covered and so many stories been told, today has a more laid back feel before we head home. The morning will be spent again taking in some of the places more personal to some of those in the group and visits will be made to some of the smaller places that don’t get as many visits as we feel they should. We will then all head of to the famous, haunting and never forgotten Sunken Lane and Hawthorn crater. Probably one of the most famous places from July 1st 1916 and we will take you back to a time gone past but never forgotten. A fitting way to finish any battlefield tour. Ferry crossing will be around 17:00 and our final drop in Bromsgrove will be around 22:00. A non refundable deposit of £99 will secure your seat on this truly different battlefield tour. Full and final payment is due on or before May 31st 2020. Instalments are excepted as long as final total is paid on time. All enquires, bookings, or questions to enquiries@baxters-battlefieldtours.com or call us on 07545242257. *Tour price includes collection and drop off from designated collection / drop off points, ferry crossing to and from Belgium & France, hotel stay for 4 nights, coach travel across the battlefields of Belgium & France to and from the hotel base, breakfast on days 2,3,4 and 5, picnic lunch on day 4, guidance from 2 battlefield guides throughout the tour, a qualified Nordic walking instructor, and services off the tour manager. The map shows the approximate location of the Holiday. For more information, availability and booking, please use the contact form below. Nordic Walking UK Weekend in North Yorkshire with Coreconcept Mid Derbyshire Nordic Walking.